(Nanowerk News) UC Berkeley chemists have made a major leap forward in carbon-capture technology with a material that can efficiently remove carbon from the ambient air of a submarine as readily as from the polluted emissions of a coal-fired power plant. The material then releases the carbon dioxide at lower temperatures than current carbon-capture materials, potentially cutting by half or more the energy currently consumed in the process. The released CO2 can then be injected underground, a technique called sequestering, or, in the case of a submarine, expelled into the sea. "Carbon dioxide is 15 percent of the gas coming off a power plant, so a carbon-capture unit is going to be big," said senior author Jeffrey Long, a UC Berkeley professor of chemistry and faculty senior scientist at Lawrence Berkeley National Laboratory. "With these new materials, that unit could be much smaller, making the capital costs drop tremendously as well as the operating costs." The material, a metal-organic framework (MOF) modified with nitrogen compounds called diamines, can be tuned to remove carbon dioxide from the room-temperature air of a submarine, for example, or the 100-degree (Fahrenheit) flue gases from a power plant. "It would work great on something like the International Space Station," Long said. Though power plants are not now required to capture carbon dioxide from their emissions, it will eventually be necessary in order to slow the pace of climate change caused by fossil-fuel burning. If the planet's CO2 levels rise much higher than they are today, it may even be necessary to remove CO2 directly from the atmosphere to make the planet livable. Long and his colleagues describe how the new materials -- diamine-appended MOFs -- work in this week's issue of the journal Nature ("Cooperative insertion of CO2 in diamine-appended metal-organic frameworks"). Power plants that capture CO2 today use an old technology whereby flue gases are bubbled through organic amines in water, where the carbon dioxide binds to amines. The liquid is then heated to 120-150 degrees Celsius (250-300 degrees Fahrenheit) to release the gas, after which the liquids are reused. The entire process is expensive: it consumes about 30 percent of the power generated, while sequestering underground costs an additional though small fraction of that. The new diamine-appended MOFs can capture carbon dioxide at various temperatures, depending on how the diamines are synthesized, and releases the CO2 at only 50 C above the temperature at which CO2 binds, instead of the increase of 80-110 C required for aqueous liquid amines. Because MOFs are solid, the process also saves the huge energy costs of heating the water in which amines are dissolved. MOFs are composites of metals -- in this case, magnesium or manganese -- with organic compounds that, together, form a porous structure with microscopic, parallel channels. Several years ago, Long and his lab colleagues developed a way to attach amines to the metals in an MOF to produce pores of sufficient diameter to allow CO2 to penetrate rapidly into the material. They found that MOFs with attached diamines are very different from other carbon-capture materials, in that the CO2 seems to load into the material very quickly at a specific temperature and pressure, then come out quickly when the temperature is raised by 50 C. In the new paper, UC Berkeley graduate students Thomas McDonald and Jarad Mason, together with other co-workers, describe how this works. "This material is unique in that it binds CO2 in a cooperative mechanism," Long said. "When the first CO2 starts to adsorb at a very specific pressure, all of a sudden it facilitates more CO2 adsorption, and the MOF rapidly saturates. That is really a different property from any other CO2 adsorbent based on amines. "Then," he added, "if you raise the temperature by applying heat, at some temperature all the CO2 will come flooding off." 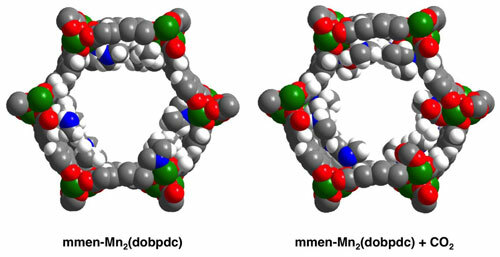 Long's team found that the diamines bind to the metal atoms of the MOF and then react with CO2 to form metal-bound ammonium carbamate species that completely line the interior channels of the MOF. At a sufficiently high pressure, one CO2 molecule binding to an amine helps other CO2 molecules bind next door, catalyzing a chain reaction as CO2polymerizes with diamine like a zipper running down the channel. Increasing the temperature by 50 degrees Celsius makes the reaction reverse just as quickly. The pressure at which CO2 binds to the amines can be adjusted by changing the metal in the MOF. Long has already shown that some diamine-appended MOFs can bind CO2 at room temperature and CO2 levels as low as 300 parts per million. The current atmospheric concentration of CO2 is now 400 parts per million (ppm), and policy-makers in many countries hope to reduce this below 350 ppm to avoid the most severe impacts of climate change, from increasingly severe weather events and sea level rise to global average temperature increases of 10 degrees Fahrenheit. Last summer, Long co-founded a startup, Mosaic Materials, to use the new technology to radically reduce the cost of chemical separations, with plans in the works for a pilot study of CO2 separation from power plant emissions. This would involve creating columns containing millimeter-size pellets made by compressing a crystalline powder of MOFs. "We're also hoping to develop something that might be tested in a submarine," Long said. That would pave the way for eventual scale-up to capturing CO2 from natural gas plants, which produce emissions containing about 5 percent CO2, to the higher concentrations of coal-fired power plants. "We got lucky," he said. "We were just trying to find a simple way to attach these amines to our MOF surface, because they are one of the best compounds for selectively binding CO2 in the presence of water, which can be a problem in flue gas. And it just happens we got the right length in the amine to make these one-dimensional chains that bind CO2in a cooperative manner." Long suggested as well that the findings may have relevance for the fixation of CO2 by plants, owing to striking structural similarities between the magnesium-based MOF and the naturally occurring CO2-fixing photosynthetic enzyme RuBisCO.